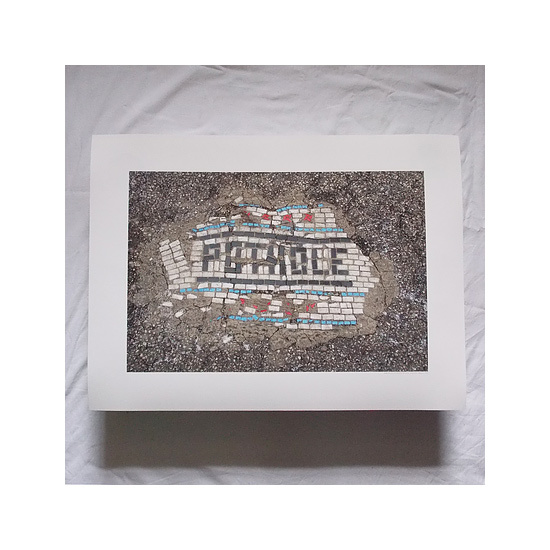 Joining us for his very first RUN we welcome in artist bachor, who joins us with Bombpop, featuring a wide variety of his signature repurposing of potholes that has shown up throughout the Midwest. Read on as bachor gives us the story behind these pieces featured in his debut RUN, influences and much more. . . This RUN is signed by Jim Bachor and includes a Letter of Provenance from 1xRUN. The framing option for this RUN includes a 1 inch black wood frame with UV-glass foam core backing and ready to hang hardware. Chicago artist Bachor adapts the mosaic, an art form that dates to at least the third millennium BC, and applies it to contemporary American life. From junk food to potholes to breakfast cereal, his vibrant work permanently locks into mortar unexpected concepts drawn from the present. Using the same materials, tools, and methods of the craftsmen of antiquity, he creates mosaics that speak of modern things, but in an ancient voice. By harnessing and exploiting the limitations of this indestructible technique, Bachor’s work continually surprises the viewer, while challenging long-held notions of what a mosaic should be. Bachor’s work has been included in juried shows throughout the country and his pothole art project has attracted world-wide attention since 2013. Recent public art commissions include “thrive”, a 700+ sqft mosaic installed at the Chicago Transit Authority’s Thorndale Red Line station and “RUN CHI” located within Niketown in downtown Chicago. In 2017 Bachor's work was featured on CBS Sunday Morning, Oprah Winfrey's "O" Magazine and on the cover of the March issue of Chicago Magazine. Follow Bachor on Instagram @jimbachor, on Twitter @bachor, & on Facebook.